WIN A HASBRO TOY BUNDLE FOR NOVOTEL SUPERHEROES DAY! On Saturday 04 June 2016, Novotel hotels invite families to enjoy a FREE family fun day at any of their 33 Novotel hotels in the UK. To celebrate they are offering one lucky winner the chance to win the ultimate toy bundle. Filled with products that every superhero will be excited by from brands including Play-Doh, My Little Pony, and Frozen from Hasbro as well as Fruit Heroes, the perfect snacks to fuel young caped crusaders and the first children’s fruit snack to be accredited under 5% free sugar with the Sugarwise label. KAPOW! From fighting to save the planet, undertaking missions from the Craft Captain to creating some tasty delights (no Kryptonite allowed near by) there is a whole host of activities available for children aged 5 to 11 years old. BLAM! There will also be fun in store for Mum and Dad! All activities are designed so that parents can participate with their little heroes. Kripes! And every superhero gets a goodie bag filled with products! If you are looking for your next family getaway don’t forget that kids stay and eat breakfast for free at Novotel hotels in the UK. Most Novotel hotels also feature a dedicated kids corner to help keep kids entertained. Families can also take advantage of free Wi-Fi so they can share their photos and holiday stories with friends and loved ones, or even send a digital postcard home from the Moncierge virtual concierge in the Novotel lobbies. 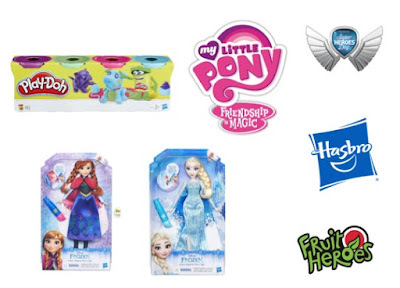 *The winner will receive one toy bundle including one product from each of the following Hasbro brands, Play – Doh, My Little Pony and Frozen contents could vary. I would like to win as I want to donate as many toys as possible to the childrens hospital I go to regularly in Cambridge. I will certainly consider thaking my kids to our nearest Novotel to take part in the superheroes activities! I would love to win this bundle for my little superheroes! Great prize package for the kids. Not sure, though Superheroes Day sounds like a good idea. well its my daughters birthday next month and these are some great toys that my daughter would love! and not sure if i will as will have trouble getting there. I'd love to win for my 3 children :) Hasbro toys are fantastic quality! I'd love to win because it would make my children, niece and nephew very happy on our big family holiday this Summer! We don't have a Novotel nearby otherwise I'd love to have taken my little boy. Id like to win for my daughter :) and unfortunately i wont be attending as we are away at the time. I would love to win for my Niece. She absolutely adores Frozen and My little pony. I didn't know about the day so will definitely be looking in to our local one sp thank you for the heads up!I would love to win for my two little superheros as they deserve a special treat! I would love to win because both my kids would love all these toys. would like to win this for the nieces little ones! My daughter's birthday is coming up soon and she'd be in her element if I won. I would love to win as my kids love playing with my playdoh and my little pony pony so this would be perfect! We can't make the celebrations at the Nocvotel but we would love to win so we can celebrate all things superhero at home. I would love to go to one of these days out but there are no hotels near me! I'd so love to win for my little ones whose fav heros are Iron Man and Elsa. Mine is also Iron Man! I'd love to win a fab Hasbro bundle as their toys and games are always really fun and the children just love them. Sadly all the spaces at the Novotel events anywhere within driving distance were taken long ago apparently? I would love to win as my niece would love these toys. I would love to win as my children would think these toys are amazing. I did try to sign up to the Novotel event but unfortunately my local one is fully booked. My son is super hero obssessed, but sadly we wont be able to attend superheroes day as we are at a birthday party. No I won't be going. I would love to win as a treat for my kids. We tried to get tickets for superhero day but all fully booked locally! I would love to win to treat my two kids. We wont be heading to the Superheroes day - nearest Novotel a bit too far for us - looks fun though! I'm not too sure where my nearest novotel is! Saturdays are busy days so we won't be attending but I would love to win these toys foy my nieces. The whole household loves Frozen and I am sure they would love playing with playdoh. I'd like to win this for my daughter. Unfortunately there isn't a Novotel too near us but we stayed at one recently and I was super impressed with the kids corner and how they were with my daughter! I love to win treats for my children x Don't think we'll get to super heroes day, sounds fun though! I would like to win as I have a big family with lots of children (my own + nieces and nephews etc) and this would be great to win and share with them all. I may attend the superhero day if it isn't conflicting with other arrangements, I didn't know about it before this so we shall see..
it make an amazing gift for my sister and yes! I'd love to win for my little girl, and hopefully we will be going to our Novotel Superhero Day! Would be a great bundle for my son and niece to play with in the summer holidays. I would attend a super hero day if there was one near me. My local event is fully booked but I'd love to go! I'd love to win to make my little one smile! The Hotel closest to me is fully booked so I don't think we will be going, I would love the playdoh my little girl loves it, she is so creative! I would like to win for my kids. Would love to go but they are too far! Why would you like to win!! and will you be heading to your local Novotel Superhero Day!!! . . . . . l am aiming for my SuperGran badge and this would work wonders! ! ! Our nearest hotel is unfortunately fully booked. But I'd love to win this package to treat my daughter. One or two items to use on a long haul flight we've got coming up, and the rest put away for her birthday. We don't really know about Novotel Superheroes Day but we'd like to learn more. I'd love to win as the Grandchildren would have loads of toys to play with when they visit. I won't be visiting Novetel as my children are too old & my son usually has plans with the children. My daughter would love these toys - she is really into superheroes too at the moment. We stayed at Novotel recently and I saw the superheroes day advertised but sadly not one close enough to us that still had places available. Love the idea of it though! Would love to win for all the Kiddies in my Life! I would love to win for my granddaughter and her step-sisters. We don't live near enough to attend. I'd like to win to be able to treat my little girl to some much needed new toys. I will definitely be considering visiting! I'd love to win for my daughter. Unfortunately I don't think we have a Novotel nearby, but I'd love to go! Our youngest would love this bundle (and I suspect the older one would, too!). Unfortunately, there is no Novotel near me. would love to win for my niece! Events sound good! I would love to have a fun day out with my son, especially because it is his birthday next week! I would love to win this for my well deserving goddaughter. I won't be attending an event as we don't have one near us! I would love to win because I love Hasbro products (especially My Little Pony! ), and unfortunately we won't be going as we're moving house that weekend. I babysit my niece and three nephews a lot, so these toys would really keep them happy. Would really love to win the Play Doh :) We won't be able to attend due to family commitments. I would love to win for my son. Unfortunately our local one is all booked up! id love this for my son! Would love to win for my little girl, she would love them so much. We are definitely thinking about going! I would love to win for my little girl to cheer her up she's been feeling down lately after a teaching assistant in her class made some nasty comments about her hair. I hadn't heard of the superhero day before reading this but I will find out where our nearest one is and hopefully make it along. I'd like to win for my two daughters who would absolutely love the goodies! Unfortunately all the nearest events are booked up, but I'll look out for the next one. Because I would love to see my little granddaughter's face when she saw this marvelous prize! I would love to win these toys for my daughter and son, They always love playing together and would be nice for them to have some new toys to play with. Sadly no event near to me. I'd love to win this for my Nephew Jack who would love it. Sadly there isn't one enar to us otherwise we'd love to go. I'm afraid there's no superhero day near me! I would like to win as I'm at the age where all my friends have children now and it would be great to give them all a little treat! I'd love to win this for my friend, there's no event near me. I wasn't aware this was happening so will definitely look into this for the girls! I would love to win to be able to treat my grandchildren. Unfortunately I can't attend as we have a family wedding on 4th June. Wow what a lovely giveaway. Will definitely have a look at joining in this fab day. I would love to win to gift this to my nephews - no I probably won't attend myself but their parents would! I would like to win for my daughter, I'm sure she'd be over the moon with anything frozen! Great prize as we are off to disney and will make a great pre holiday treat. I'd love to take my daughter to Superhero day. She would love it. I will certainly consider taking my 4 kids to our nearest Novotel to take part in the superhero day!I would love to win this bundle for my superheroes! I'd love to win to treat my children. We are going to the Superhero day - we are booked in to the one Nottingham/Derby :-) Can't wait! Would love to win for my nieces and grandson ! I'd love to win this for my granddaughter. It's her birthday next month and she loves Frozen, My Little Pony and Play-Doh. I'm not sure yet about the superhero day. We'll have to check to see if there's one near us. I would love to win the toys to keep my children busy during the holidays. I will certainly try my best to take them to the Superhero event as it sounds great fun! My son is really into super heroes at the moment so we'd love to win. Id love to win for my daughter we have been to are superheros day last week was fantastic! Because I live with a four year old real life super hero who takes on a brand new alter ego daily . . . he would be over the moon! I would love to win because it would make me very popular! :) Sadly we are nowhere near a Novotel so won't be attending, shame because they sound amazing!